Some 32,000 people started new businesses in Ireland in 2013, and one 11 in of the adult population are now engaged in some form of early-stage entrepreneurial activity, according to the latest Global Entrepreneurship Monitor (Gem). According to the findings, entrepreneurial activity is at its highest since the economic crisis began. The number of people indicating that they intend to start a business in the next three years increased significantly in 2013 and is now at its highest level since Ireland first became involved in Gem research in 2000. Ireland’s total early-stage entrepreneurial activity was 9.2pc in 2013, up from 6.1pc in 2012. Ireland is now ranked second in this regard across the EU15 and ninth among the EU28 countries. The 2013 report also reveals a further narrowing of the gender gap as regards entrepreneurial activity in Ireland. There are now 1.4 times as many men as women who are new business owners. The ratio is 1.9 to 1 in terms of total early-stage entrepreneurs. The report notes that while there had been a serious concern about the pipeline of entrepreneurs for the future, this was turned around in 2013 with 14.7pc of the population indicating their intention to set up a new business in the next three years. This is higher than EU15 average (11.5pc) but somewhat behind EU28 (15.9pc). Early-stage entrepreneurship is higher among immigrant groups (11pc) than it is among the non-immigrant population (8.8pc). The majority of early-stage entrepreneurs expect to become employers (85pc). At 22pc, the number of early-stage entrepreneurs who have ambitious growth aspirations and expect to employ 10 or more after five years compares very favorably with international averages. Thirteen percent of early-stage entrepreneurs have, or expect to have, 75pc or more of their customers in overseas markets. This is the fourth highest rate for significant exporters across the OECD. Irish early-stage entrepreneurs are relatively innovative with 27pc of their products/services considered new to all customers compared to their international counterparts, 17pc (OECD), 16pc (EU28) and 18pc (EU15). The report also reveals that the level of perception of supportive media coverage about entrepreneurs in Ireland (60pc) remains higher that the international averages across the OECD (51pc), EU28 (49pc) and EU15 (49pc). The rate at which individuals are turning to entrepreneurship out of necessity continued downward trend its downward trend from 28pc in 2012 to 19pc in 2013. This rate is lower than the international averages across the OECD (21pc) and EU28 (24pc) and broadly similar to the EU15 (18pc). The rate at which entrepreneurs were discontinuing their business increased slightly from 1.2pc in 2012 to 1.9pc in 2013. This rate is on par with the averages across the OECD (2.1pc), EU28 (2pc) and EU15 (1.7pc). The GEM report is supported by Enterprise Ireland, Forfás and the Department of Jobs, Enterprise, and Innovation. 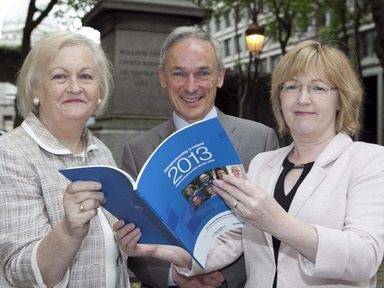 The authors of the report are Paula Fitzsimons of Fitzsimons Consulting, who is the national Gem co-ordinator, and Dr. Colm O’Gorman, professor of entrepreneurship, DCU Business School.